Happy Oktoberfest season everyone! This is a most exciting time of year when many of harvest time ales start hitting the shelves and we start putting away the lighter summer time brews and switch to a more flavorful batch of brews. I saw this new bottle at the store and just had to pick it up. 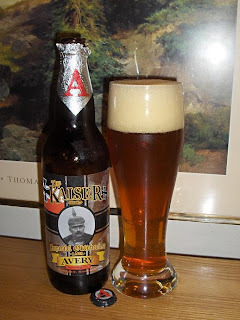 This is another of Avery Brewing Company's seasonal fare and I normally jump at the chance to try their latest batch. Today's review is of their 2008 release of The Kaiser - Imperial Oktoberfest. The beer comes with a foil wrap and has a picture of Kaiser Wilhelm II in his military uniform and pointy hat. I've had Oktoberfest brews before but not an Imperial one, so I had to try it. This 22oz bottle weighs in at a hefty 10.03% ABV, a bit higher than previous years. This lager pours a dark orange / copper color and had a nice big off white head. It poured clear in my 18oz tall pilsner glass. I noticed a constant multiple bubble stream coming up from the bottom of the glass and it looks adequately carbonated. The head left a small distinct lacing down the glass. The brew has a sweet hop aroma. It was floral with the noble hops and medium roasted malts. It almost reminded me of a Belgian brew. Avery put in 4 kinds of German hops and a few European malts in this brew. The IBU rating is only 24 but you do notice the hops. I enjoyed the sweet malty taste. The alcohol was not as overpowering as you might think, but make no mistake, it will creep up on you by the end of the bottle. This is a full bodied beer, not light or watery. I was eating some spicy Oriental orange chicken from Panda Express along with this beer. The chicken was a tad on the hot side and the beer simply accentuated the burn, but it was a nice effect. Another thing I like about this beer is that it burps well. The flavor of the malt and hops really come out when you burp out through your nose. Don't believe me? Try it, you'll see! This was a darn good brew and matched my meal perfectly. I'd certainly buy this beer again and would recommend this as a great seasonal brew. It's on available through the end of the year. I'll give it a decent 3.4 out of 5 rating. Jawohl! Dies ist ein ausgezeichnet Bier! Have you tried this brew? What did you think of it. If you've heard of any other imperial Oktoberfest beers that you liked, let us know. Post a comment below! Thanks.